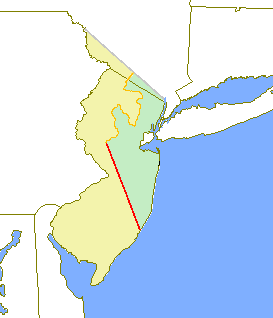 The Delaware Valley had been inhabited by the Lenape (or Delaware) Indians prior to European exploration and settlement starting around 1609, undertaken by the Dutch, Swedish and English. The Dutch West India Company had established one or two Delaware River settlements but by the late 1620s, it had moved most of their inhabitants to the island of Manhattan. This became the center of New Netherland. The development of the colony of New Sweden in the lower Delaware Valley began in 1638. Most of the Swedish population was on the west side of the Delaware. After the English re-established New Netherland's Fort Nassau to challenge the Swedes, the latter constructed Fort Nya Elfsborg in present-day Salem County. Fort Nya Elfsborg was located between present day Salem and Alloway Creek. The New Sweden colony established two primary settlements in New Jersey: Sveaborg, now Swedesboro, and Nya Stockholm, now Bridgeport. Trinity Church, located in Swedesboro, was the site of the Church of Sweden for the area. The Dutch defeated New Sweden in 1655. Settlement of the West Jersey area by Europeans was thin until the English conquest in 1664. Beginning in the late 1670s, Quakers settled in great numbers in this area, first in present-day Salem County and then in Burlington. The latter became the capital of West Jersey. Before 1674, land surveyors for New Jersey considered it as a hundred and partitioned it into Tenths. West Jersey comprised five of the Tenths. But demarcation of the boundaries awaited settlement, the quit-rents the settlers would pay, and the land surveying which the money would purchase. Thus it took years and multiple surveys to settle boundary disputes. Burlington County was formed on 17 May 1694 by combining "the first and second Tenths." At least three expensive surveys were conducted of West Jersey. Richard Tindall was surveyor-general of Fenwick's Colony, the fifth Tenth. Weslager, C. A. Dutch Explorers, Traders, and Settlers in the Delaware Valley, 1609–1644. (Philadelphia, University of Pennsylvania Press, 1961). ^ Snyder, John P. The Story of New Jersey's Civil Boundaries: 1606–1968, Bureau of Geology and Topography; Trenton, New Jersey; 1969. p. 93. Accessed September 30, 2013. This page was last edited on 7 February 2019, at 23:50 (UTC).